to a visual overview of the risk levels in your data processing. With the Risk Dashboard you will be able to better monitor and manage risk, and thereby prioritize your time accordingly and more efficiently. 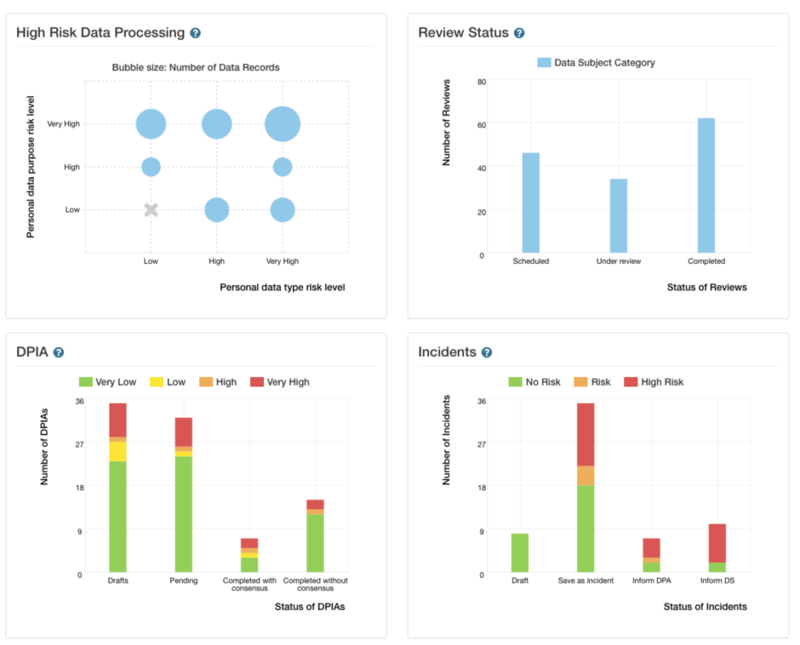 Get an immediate snapshot of where the risks in your data processing are high, the status of reviews, your DPIAs, the numbers of incidents and their risk levels. High Risk Processing – Pinpoints and flags data processing activities implicating high risk to customers or your organization. Get quick access to the underlying data with a simple click. Scheduled Reviews – Track the progress of your scheduled processing flow reviews. Understand how many reviews are in progress or completed, so you can manage effectively. DPIA Display – Have all your assessments been completed? What are their respective stages? Manage your DPIAs like never before with a full status report plus risk level monitoring. Incident Manager Overview – Incident Manager visualization gives you complete insight into each breach’s status and the actions you need to take. See where you need to act, and where you don’t. DPO-as-a-Service? Compliance officer? Whether you’re a consultant working in data protection compliance, or a member of the privacy team in your organization – Risk Dashboard delivers an essential overview of your privacy program gaps so you can take action.